3-Day Crew Fundraising Surpasses $1 Million! If walkers are the “soul” of the 3-Day, the extraordinary 3-Day Crew can best be described as the heart! They arrive the day before the event to decorate sweep vans, mark the route and commit to their 3-Day pledge to care for those of us who have the easy job of walking 60 miles over 3 days! The 3-Day Crew members are the first to greet the dawn, and the last to tuck everyone in at night. Quick with a smile and thank you to a tired walker, these folks are seemingly tireless! They work hard and toil long, often in the dark, heat or cold. They are rewarded in smiles and gratitude, and I owe them so much more than can be expressed here. My husband and I look forward to seeing their crazy costumes, clever themes, and endless smiles when we hit the pavement in San Diego next week. Unlike walkers, members of the 3-Day Crew have no fundraising requirement in order to participate. Yet today they marked an incredible milestone by surpassing $1 million in fundraising for the 2013 season! Not only have they volunteered their time and energy, they have made a remarkable impact in the fight to end breast cancer. 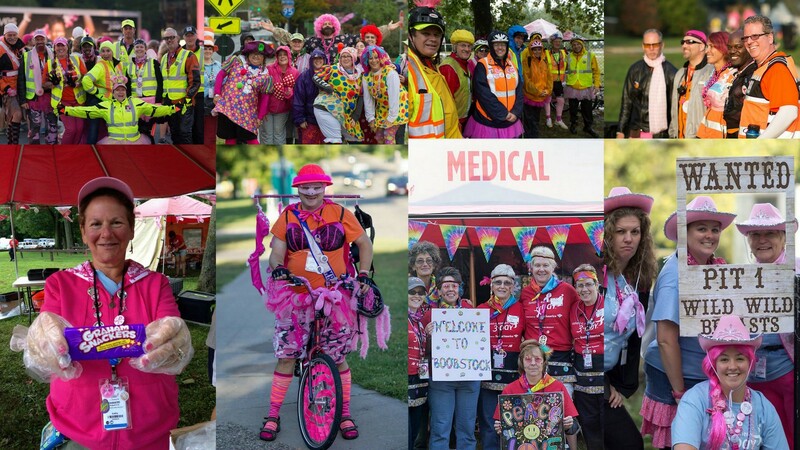 Congratulations and thank you to our 3-Day Crew for your contribution, your service and your hearts of Pink! Do you have a special 3-Day Crew memory? Please share in the Comments section below. My 3-Day is SPECIAL because of CREW. I have walked six 3-Days and on my first one, it resulted in a stress fracture. I have walked my other five 3-Days ONLY because I could count on CREW to sweep me up and get in to finish. The vans are where we have had the most special of conversations. Think about it -you are picked up because you are injured, exhausted, not well, and it is there where you get your first “treatment” from Susan G. Komen. They encourage with just the gift of a sticker, something they have made, sharing their stories, encouraging walkers on the path -they do so much. I tell everyone even remotely interested in completing a 3-Day that they (SK) has an awesome team of people who follow you on the routes and make sure you are okay. If you need them, all you do is raise a arm and form the “X” and you are safe. You can automatically see relief on their faces and they haven’t yet even walked! lol Love my Sweep Vans and Crew. Love them. I would NEVER do a 3-Day without them!